Sure, there is a lot of variance, both in the AI choices and in the result of dice rolls, and of course depending on how the fight goes a player will choose different spells and actions. The AI doesn't use fixed lists of spells to cast or actions to use, that would be very predictable. Instead it chooses on the spot a course of action among several that are considered best. So battles, especially large ones, won't be the same on replay. There is a lot of randomness in D&D. Right at the beginning of a fight you have initiative rolls. They determine the order in which everyone acts. For example if all your characters act first that is bound to make a big difference. Personally I enjoy replaying a hard battle to find the best strategy. That's why I put TOEE among my favourites, and Dark Sun had a very good final battle too. BlueSalamander wrote: The AI doesn't use fixed lists of spells to cast or actions to use, that would be very predictable. Fantastic! Too many other games fall apart when you know precisely, for the most part, what the enemy is likely to try to do to you with any consistency. I have one doubt about resolution. I read the FAQ, but my only concern is: how will be the display in a widescreen monitor (stretched or black bars on each side)? Over wrote: how will be the display in a widescreen monitor (stretched or black bars on each side)? You can play fullscreen or in windowed mode. If it's fullscreen it's stretched 320x240, and if it's windowed it's either 960x720 or 640x480. I used to play fullscreen but later on I switched to windowed as I get a crisper picture then. getter77 wrote: Too many other games fall apart when you know precisely, for the most part, what the enemy is likely to try to do to you with any consistency. I agree, for example the Lich in Baldur's Gate 2 seems to always use the same sequence of spells - meteor shower then time stop. On the topic of tactical battles, I'd like to mention two other good games - the Fire Emblem series and the Advance Wars series on Game Boy Advance. I didn't play them for a long time but I think they're very interesting and similar in some ways to tactical RPGs. Hello! Here's the latest development info. - Added anti-spam protections to the forum registration process: you need a valid email, you need to identify several video game pictures out of national geographic photographs (try registering, can you guess which games the screenshots are from?) and the user's first post must be approved by a moderator before it is published. - Added the new spell icons; and I expect to add the new weapon and item icons soon. 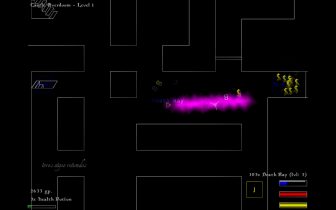 - Added some improvements in the way pathfinding handles threatened areas and entangle areas. - Fixed a problem with the update of character speed in combat when a character removes his armour or is hasted. - Added the OGL's hampered/minimum movement rule: a non-paralyzed character can always move by at least five feet using a full round action (a real mess to add this). This prevents Slowed + Blinded creatures looking as if they're paralyzed. - Fixed a bug where a character could charge even when blinded, fatigued, etc. - Fixed an animation problem when the party triggers a script that's not intended to have any effect at the time the party triggers it. - Reworked the gorgon sprite to make it fit the perspective better. The game reminds me of Gauntlet, with the difference that it's more complicated in terms of spells, there are fancier spell effects, and all monsters are represented with letters like in rogue-like games. Not really my cup of tea though. 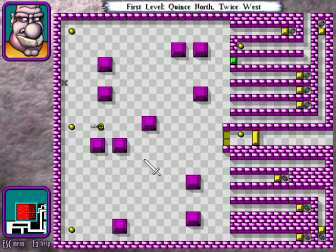 The last picture is from another game like Gauntlet - only it's turn based this time and the gameplay is focused on puzzles. It's Deadly Rooms of Death. Since I'm talking about things that have nothing to do with Knights of the Chalice, I'll mention a TV series I've just discovered: Gene Roddenberry's Andromeda. I thought it was going to be a poor copy of Star Trek, but the three first episodes were surprisingly good. It's like a video adaptation of a science fiction RPG complete with moral issues, nuclear ("nova") bombs, civilizations at war and the hologram of actress Lexa Doig. -Glad to see spam protection arise, I figured something like that would be necessary when those spammers showed up earlier this week. -Nice to see the improvements and fixes chugging along as usual. 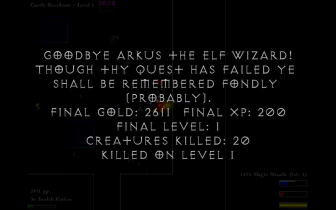 -Congrats on making it through the tutorial on Triangle Wizard. Your first character actually fared far better than my own since I never made it beyond a few feet from the start----lesson being it is a good idea to check a player starting guide and manual BEFORE diving in head first with an unknown class, unfamiliar spells, not really remembering any controls, etc. 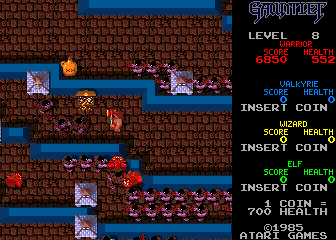 -Gauntlet is good stuff, though I remember a couple somewhat more complex 2D Gauntlets that I think existed on the SNES and Genesis that took them in a more RPG direction before the 3D one in the arcade/N64 came along. -If DROD interests ye, track down DROD: Tendry's Tale by the same developers---throws the whole lot of it into RPG sensibilities as per the puzzling...seems quite nifty and is somewhere on my todo list. -Andromeda was a pretty solid show from my own memories of it....followed it up through the first couple seasons but then got totally lost with broadcast shuffling and whatnot and have no idea what became of the show from there. Andromeda changed direction after its first two seasons. But those two were cool. But right now, I'm involved with the final season of Battlestar Galactica. I recommend it to you. - Reworked the icons used to describe character conditions such as Slowed. - Fixed a AI bug with spellcasters who use a weapon, shield and armour together with the Still metamagic feat. Next I need to rework the inventory screen to make more room for the new icons as they're a bit bigger than what I was using. The artist who finished the weapons and items will work on large pictures like the starting screen. Good job to all---graphical stuff is pretty essential to the final product turning out well and being intuitive afterall. Good work. It seems the end is near.